Highlands Ranch, CO was originally occupied by Native Americans and began being settled as ranch land in the late 1850s. The Gold Rush drove people to the area and most of the city’s expansion occurred after the early 1990s. Highlands Ranch is now home to a population of about 96,713 and resides in Douglas County. 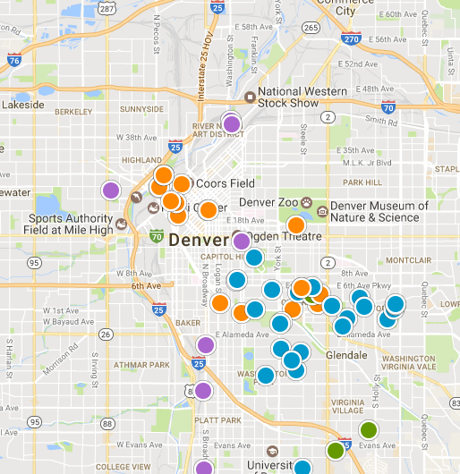 It is located just 10 miles southwest from the Denver Tech Center and about 20 miles south from the heart of downtown Denver. Highlands Ranch is home to over two-dozen parks, 2,200 acres of open space and more than 70 miles of trails. The parks and open space incorporate sports fields, community gardens, dog parks, skate parks and an inline hockey rink. In addition to the Highlands Ranch Golf Course and the Links Golf Course, locals are within minutes from the Chatfield Lake and Chatfield State Park. Residents in Highlands Ranch can take a day trip to the beautiful Rocky Mountains for some hiking, skiing or fishing, or they can enjoy all of the amenities of nearby downtown Denver. All-together, Highlands Ranch has 27 elementary schools, five middle schools and seven high schools. Students have both options to attend either a public or private school of their choice. The median sales price for a single-family home in Highlands Ranch is around $441,500, which is about a 4% increase from the previous year. Renters looking for apartments and houses in Highlands Ranch will find a median rental value of around $2,300. Want to see the latest Highlands Ranch housing market activity? Create a free custom market report for YOUR neighborhood or area!